Howdy, partner! 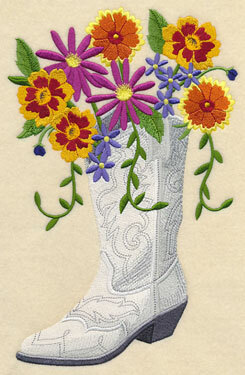 Stitch the best that the wild, wild west has to offer with these new machine embroidery designs. Add a touch of Western charm to pillows, quilts, or tote bags with these designs featuring cowboy boots, horseshoes, and more! 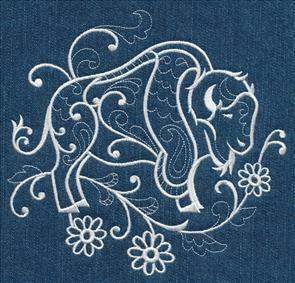 Blooming country symbols come to life on jackets and framed artwork, while Western whitework bring stitched elegance to quilts and wall hangings. 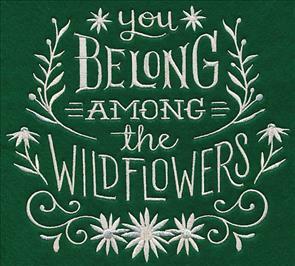 Embrace your inner cowboy with cute, quick-stitching sayings, or decorate table or bed linens with vintage-style Western wildflowers. The opportunities are endless! 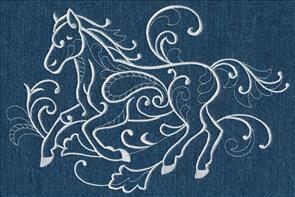 Trot down the page to see these new designs! 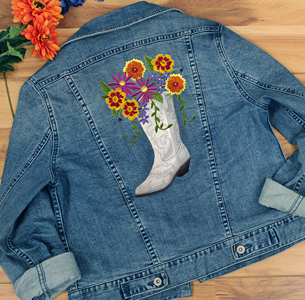 Show off your Western style with a denim jacket adorned with these new designs. Soft, stunning petals contrast beautifully with the simple lines and classic shapes of these classic Western motifs. 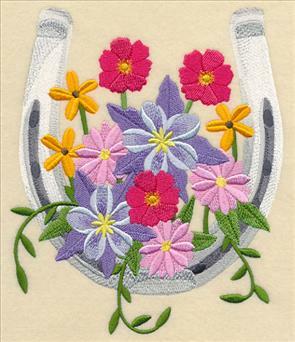 A horseshoe and a cowboy boot add fun Western flair to a wide variety of projects including pillows, framed artwork, and wall hangings. 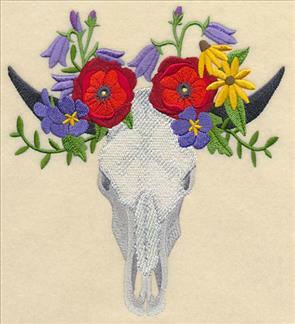 6.89" x 10.32" and 5.86" x 8.78"
5.21" x 7.81" and 4.58" x 6.87"
A steer skull bursting with colorful blooms brings unexpected beauty to your embroidery. Stitch this sweet mare onto any project for a hint of country charm. 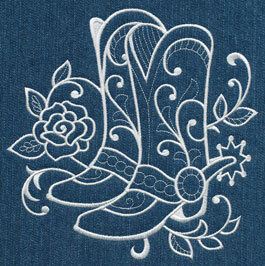 6.89" x 9.17" and 5.86" x 7.80" and 4.86" x 6.47"
Kick up your heels with chic country whitework! 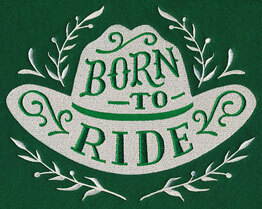 Update jacket backs, tote bags, and quilts with these designs fit for any cowboy or cowgirl. The light and open areas are perfect for stitching on smooth, neutral fabrics, like the denim used here. 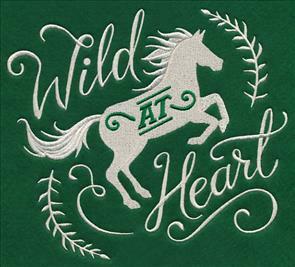 7.80" x 6.95" and 7.19" x 6.41"
6.58" x 5.86" and 5.45" x 4.86"
Give your next machine embroidery project a look straight out of the wild wild West with a pair of horseshoe and stallion designs. Perfect for any country-theme decor, or for horse-lovers, too. 7.82" x 7.11" and 7.00" x 6.37"
6.45" x 5.87" and 5.35" x 4.87"
7.80" x 5.19" and 6.86" x 4.57"
Along the great open plains of the West, bison and coyote roam freely. 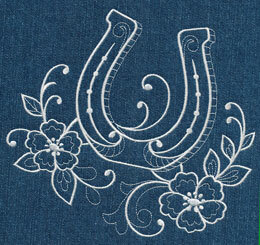 Embody the feel of a Western landscape on your next embroidery project with these whitework designs. 7.79" x 7.33" and 6.91" x 6.51"
6.21" x 5.84" and 5.16" x 4.86"
7.79" x 7.75" and 6.94" x 6.91"
5.88" x 5.86" and 4.89" x 4.87"
Each of these designs feature light flourishes, natural accents, and the classic whitework style -- add to tote bags, home decor, apparel, and more. 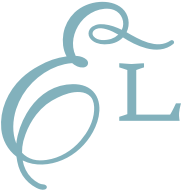 6.91" x 10.11" and 5.86" x 8.57" and 5.34" x 7.81" and 4.69" x 6.86" and 2.66" x 3.89"
Purchase these elegant and eye-catching designs individually by clicking the links above, or get all 7 of the Western whitework designs in a pack. 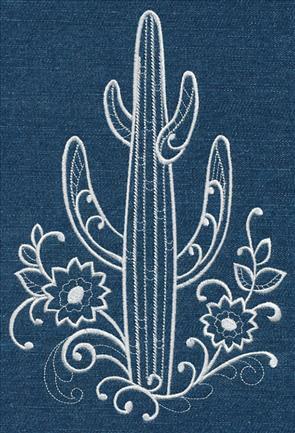 Beautiful Western wildflowers are quick, light-stitching additions to tea towels, bed linens, and other smooth, neutral fabrics. The blooms below are Mountain Phacelia, Baby Blue Eyes, and Indian Pink long-stem flowers. 4.75" x 11.74" and 3.81" x 9.42"
3.17" x 7.82" and 2.78" x 6.87"
5.58" x 11.75" and 4.45" x 9.38"
3.70" x 7.80" and 3.27" x 6.87"
5.53" x 11.74" and 4.43" x 9.40"
3.67" x 7.81" and 3.22" x 6.85"
Indian Paintbrush, Foothill Larkspur, and Cliff Rose are blossoms commonly associated with the West. 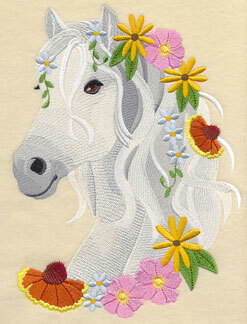 Let one grow on your next embroidery project! 5.28" x 11.74" and 4.22" x 9.39"
3.50" x 7.81" and 3.09" x 6.88"
5.10" x 11.74" and 4.09" x 9.39"
3.39" x 7.79" and 3.00" x 6.88"
Showcase these beautiful blooms on a Western-theme tote bag! 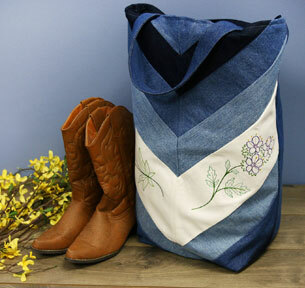 Strips of denim add a patchwork effect to the tote, while Indian Paintbrush and Mountain Phacelia bring the beauty of the great West. Find this new tutorial right here. Finish this garden of Western petals with designs featuring Centaurium, Mountain Aster, and California Poppies. 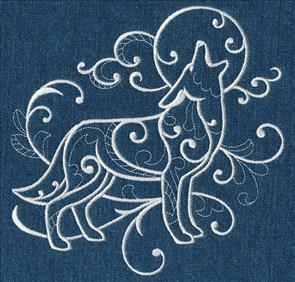 A light and lovely addition to any quilt, gardening gear, or tote bag. 5.40" x 11.74" and 4.34" x 9.40"
3.60" x 7.83" and 3.17" x 6.87"
5.40" x 11.74" and 4.33" x 9.41"
3.59" x 7.81" and 3.16" x 6.86"
5.59" x 11.74" and 4.48" x 9.39"
3.71" x 7.79" and 3.27" x 6.85"
Bring the beauty of these Western wildflowers to your home on quilt blocks, pillowcases, and more. Get all 9 of the vintage-style flowers in a pack. 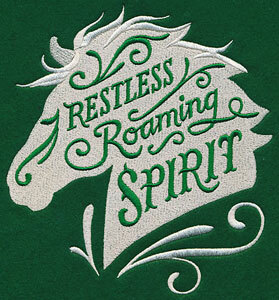 Show off your wild and wandering soul with rustic sayings and samplers! 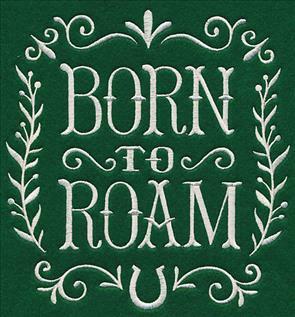 Whether you are "Wild at Heart" or have a "Restless Roaming Spirit," each of these country quotes stun on tote bags, framed art, and more. 7.76" x 6.85" and 6.65" x 5.87"
6.85" x 7.27" and 5.86" x 6.21"
4.86" x 5.15" and 3.64" x 3.87"
Welcome friends and family into your crazy country home with a friendly "Howdy". 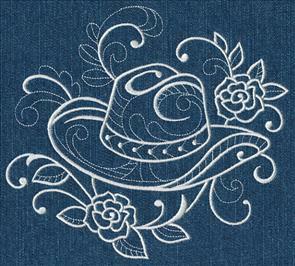 Or, show your love for riding with this cowboy hat design. 9.88" x 6.85" and 7.80" x 5.40"
8.46" x 6.85" and 7.24" x 5.87"
6.00" x 4.87" and 3.85" x 3.13"
Pillows, quilt blocks, and wall hangings get a sweet update with a "You Belong Among the Wildflowers" design. 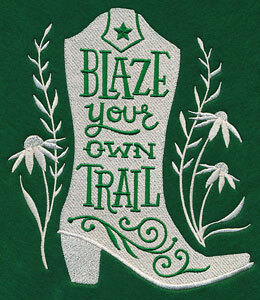 Adorn totes, saddle bags, and jacket backs with a "Blaze Your Own Trail" motif. 7.64" x 6.85" and 6.54" x 5.86"
6.85" x 7.61" and 5.86" x 6.51"
4.86" x 5.40" and 3.47" x 3.87"
Love to roam? 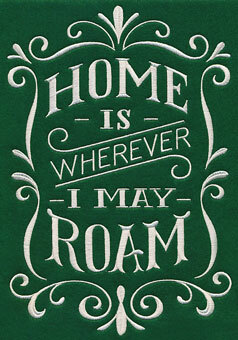 Any wanderer will love these chalkboard-inspired Western sayings. 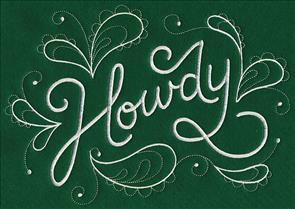 They're a terrific quick-stitching option for any embroiderer, plus these fun quotes will stun wherever you stitch them. 6.86" x 7.19" and 5.86" x 6.14"
6.89" x 10.05" and 5.87" x 8.57"
5.34" x 7.79" and 4.68" x 6.83"
Native American culture values dream catchers as a way to keep away bad spirits and nightmares. Make a breathtaking freestanding lace dream catcher to hang in your bedroom! 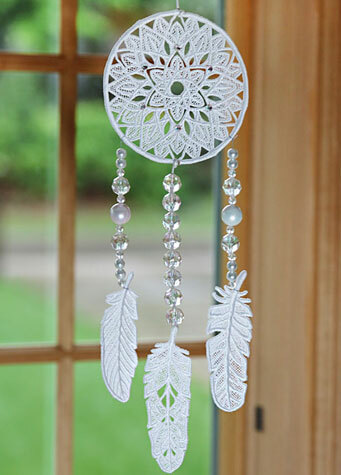 Click here to find out how four lace pieces come together to make this feather dream catcher. 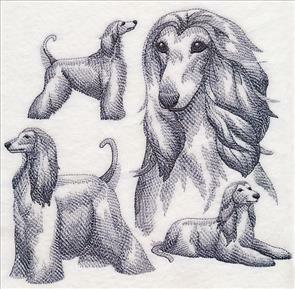 5" x 7" and 4" x 4"
Dog breed designs are some of our most popular motifs on the website! 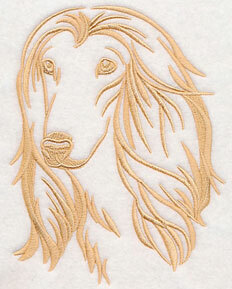 Laura requested a sketch and silhouette to match her Afghan Hound, and we loved the idea. See even more animal sketches here. 5.86" x 7.50" and 4.86" x 6.21" and 3.02" x 3.86"